Chance to win 4 Cars. Every purchase of 50 QR entitles the customer for a coupon. The coupon will be qualified for the Raffle Draw. 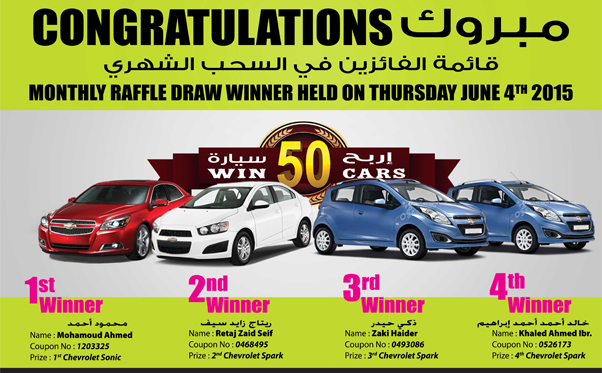 Congratulations for the monthly raffle draw winnders held on Thursday June 4th 2015 includes 4 cars (CHEVROLET SONIC , CHEVROLET SPARK ,2 CHEVROLET SPARK) . * There is a common draw on all the outlets of Ansar Group of Companies across Qatar.